Keith Curle has enjoyed an impressive start to his reign as Cobblers boss, but has warned it is going to take time for the team to really click into top gear. Town entertain Forest Green Rovers on Saturday (ko 2pm), still searching for their first home win of the season. Curle claimed his first win as Cobblers boss in Tuesday night’s Checktrade Trophy clash at Oxford United, and he preceded that with Sky Bet League Two draws with Bury and Swindon Town. 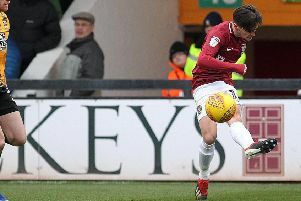 Those results have raised spirits around Sixfields among the players and supporters alike, but Curle is keen to stress he is still very much at the foundation stage of finding his strongest team. He says there were encouraging signs during the 2-1 win at Oxford, but there is still a long, long way to go before his players instinctively do what he wants them to do out on the pitch. “I thought in the first-half the foundations weren’t quite there,” said Curle. “Rather than playing the ball into a good area, we were waiting to see if someone was running into that area and then you become too negative. “You need to instil that discipline into the players. “We know where the right ball is and where the right area is to play it into, so the more understanding you get within the dynamics of what we’re trying to create, the more people get on the same page. “The worst thing that happens is people put the ball into a good area and somebody doesn’t run onto it. “My job is to get somebody to run into those areas on a consistent basis. “I thought we clicked in the second-half and we knew where we were going but winning a game doesn’t mean the platform is in place. As well as Curle taking the top job at the PTS Academy Stadium, Colin West is settling into his role as the assistant boss, and Dan Watson is now the new goalkeeping coach, replacing Colin Day. “We’re still learning about each other,” said Curle. “The changing room is learning about myself Colin and now we’ve added another dynamic into the group with Dan Watson. “A changing room is not an easy place with the amount of changes that are going on but what we’ve tried to do is simplify the roles and responsibilities and the demands that we put on the players. On the appointment of Watson, Curle said: “He’s come in as goalkeeping coach and replaced Chris Day and this is about me taking control of my working environment. “I’ve worked with Dan before. I employed him at Carlisle and he’s an excellent goalkeeping coach.